This is one metal apex shed that even timber traditionalists will enjoy. We were very impressed by the wood effect colour of the cladding and the shiplap style of the cladding. 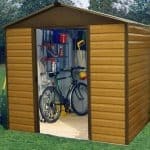 It means that you get the classic shed look, while still having all the advantages that metal provides. 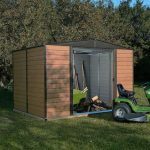 Foremost among these is that there’s no need to treat the shed on an annual basis, saving the owner both time and money. If you’re taller than average, then you’ll also love the high eaves that are a standout feature here. At six feet tall, and with corresponding generosity in the height of the double sliding doors, you’ll have more than enough room to move around in, and to carry goods in and out. Because the shed also has integrated ventilation, the interior feels airy and comfortable, so this is a shed that you won’t mind spending plenty of time in. Because of its generous proportions, there are a lot of screws and bolts involved in assembly, but by following the instructions carefully it can go up sooner than you think. We were pleased to see that the anchor kit was included as standard, and there’s even a solid pair of work gloves for use when handling the weather resistant galvanised steel, which is a nice touch. The first thing that struck us about this shed was its appearance, and we have to say that we found it impressive. From a distance it’s hard to distinguish it from a timber shed, so convincing is the wood effect cladding. Even the doors, gables and roofs are in an attractive dark walnut colour. Not only the colour, but also the shiplap panelling is reminiscent of classic wooden sheds that have graced our gardens for decades. Another striking point is the generous height of the shed, and we were pleased to see that this is further enhanced by an apex roof which also forces rainwater to run harmlessly away from the interior. The ridge height is 2.15m and the eaves height is 1.83m, or six foot. 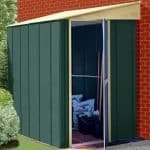 The overall width of the shed is 2.43m and the overall depth is 1.97m, and these correlate to the dimensions you’ll need to use for the base. We of course take an interest in how functional a shed’s cladding is, but even though this is a thin clad metal shed, as we’d expect for the price, it still felt strong when fully assembled thanks to the effectiveness of the hot dipped galvanisation to which the steel core has been subjected. As well as function, this cladding has a very pleasing form. We really liked the shiplap effect, as it’s something we rarely see on the metal sheds we review, and as on wooden shiplap sheds it helps to carry water away. There is no floor included, as the shed is simply assembled on top of a pre-existing area of level concrete. It was good to see that the anchor kit was included, and that the expansions screws were themselves galvanised to give them extra weather protection. We liked the fact that this shed has three classic ingredients in the fight against rain: an apex roof, tough galvanised cladding, shiplap style panels. This should prove very effective at keeping rust away, so it was a little disappointing that the warranty offered against perforations caused by rust is only valid for 10 years. There is no treatment required during this period, and the powder coated paint should also retain its good looks for this period and probably longer. We are used to reviewing sheds whose double doors are accommodating width wise but not so accommodating when it comes to height, so were relieved to find that there was no need to bend down at all when entering this shed. That’s also a bonus when carrying heavy or bulky goods as it allows you to adopt a more correct posture even when entering the shed. The door width is 1.01m and the door height 1.78m. We also liked the internal fitting of the sliding doors, as it both looks neater and is more resistant to knocks and bumps. There are no windows on this shed, so we’d recommend having a light source available if you want to spend any length of time in it. What is included, which we liked, is an integrated ventilation system. This not only allows a good airflow, it can help to combat condensation. With no windows included, there’s no way that potential intruders can see what’s stored inside, making it much more likely that they’ll pass by and seek out more obviously rewarding targets. 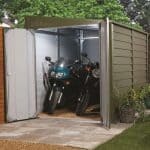 We believe that security is one of a shed’s most important features, which is why we would have liked to see a padlock included as part of the standard package. They can be inexpensive to buy, however, and the handles are holed and ready to accept one. With a shed of this size we would have liked to see options to add a skylight or window, as this would have made it even more versatile. There are a range of optional extras that are available, however, including a tool rack on wheels, perfect for the serious DIYer, and a water station. One optional extra we really liked, was the four shelf portable racking. It’s strong and sturdy, and a great place to store smaller tools such as trowels, hacksaws or dibbers. 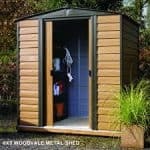 The immaculate wood effect finish was a good indication of this shed’s overall quality, as was the use of rust resistant screws. We feel that the warranty against rust could have been slightly longer, even though the cladding wasn’t the thickest we’ve seen. Its galvanised nature should see it outlast the 10 year period. It’s good to see a shed where the height doesn’t compromise the width and depth. 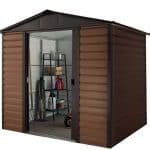 In fact, we found that the height of this shed means that you can store even more goods inside making it deceptively spacious. There are a lot of parts with this shed, many of them small such as the screws. You’ll need at least two people, and a third could prove useful. We finished installation in around five hours. A longer warranty would have made this even better value for money, but we like the little extras such as the inclusion of gloves and an anchor kit as standard. 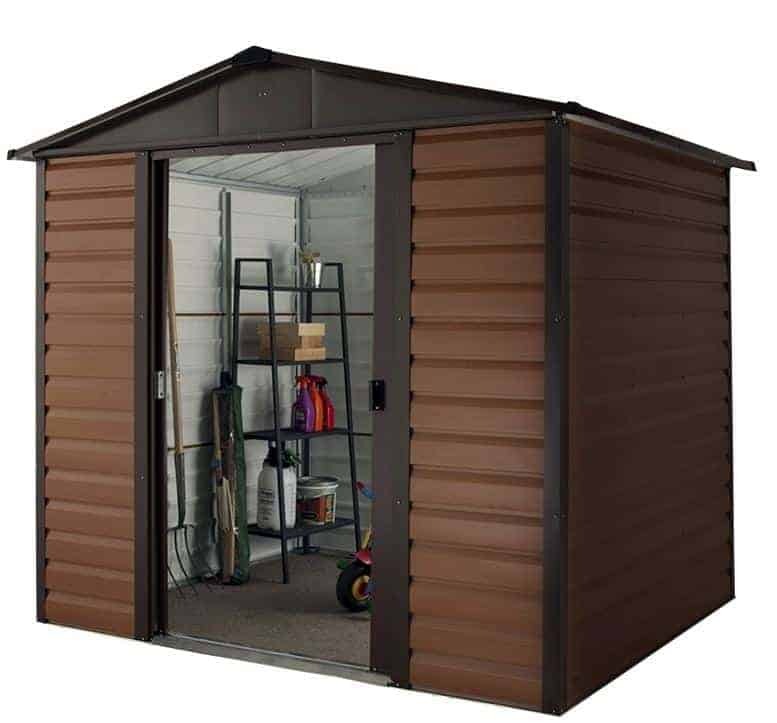 Final Thoughts: This is possibly the most attractive metal shed we’ve reviewed, and we know that this is an asset that many people prize highly. Thankfully we found that the performance of the shed didn’t let down its looks. The apex roof and galvanised shiplap cladding are both excellent at keeping rain at bay, and your contents safe and dry. The ventilation also helps here, as it stops internal temperatures from getting too high during the summer months. 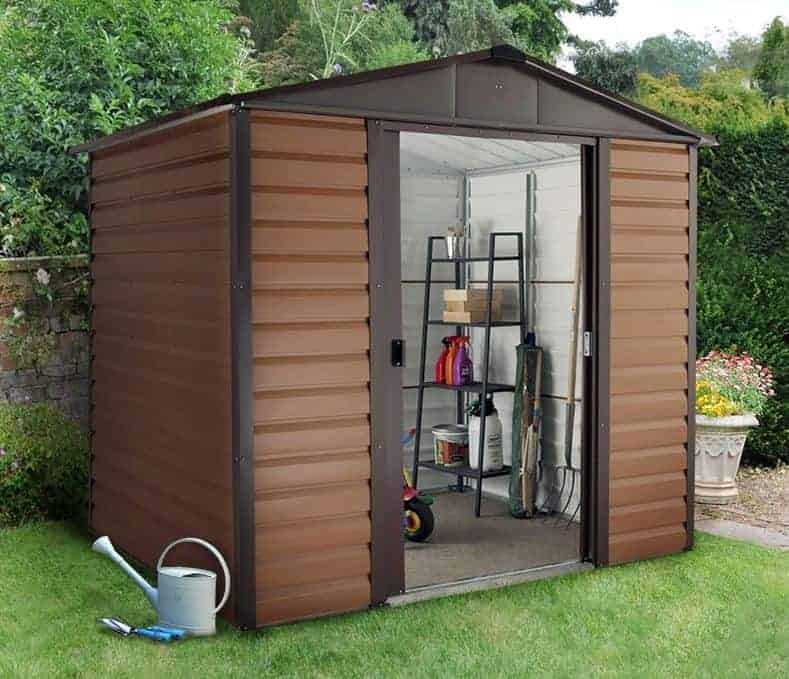 With the introduction of a lighting source, and a padlock on the door, we can imagine this shed being used as a mini workshop, particularly as it’s so easy to move around in.